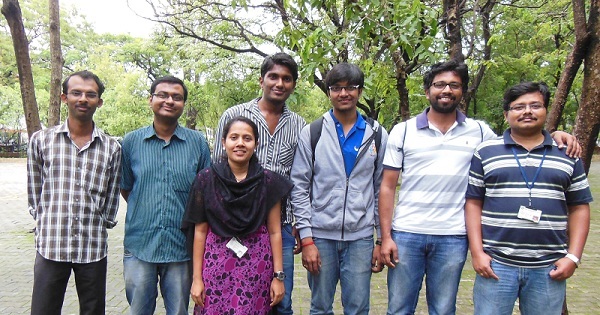 Shivesh Anand (third from right) interned at Council of Scientific and Industrial Research (CSIR, Pune)- National Chemical Laboratory, and shares with us his wonderful experience. Shivesh is a student of five-year dual degree program in Electrical & Electronics Engineering with M.Sc Chemistry at Bits Pilani. Read his interesting story in his own words. National Chemical Laboratory, Pune, is one of the 37 constituent laboratories under Council of Scientific and Industrial Research (CSIR). I landed at NCL (fortunately!) because of the Practice School program of BITS Pilani. Every BITSian has to undergo a two-month internship program (termed PS-1) after their second years at a particular station which is allotted to them based on their CGPA. But due to some inevitable reasons, I did my PS-1 after completing my third year (again, fortunately!). The reason for this second “fortunately” may bore you off but please bear with me. Actually this one year gave me a chance to improve my CGPA because of which I was able to bag a PS station like NCL; also it was for the first time that NCL was included as a PS-1 station. So, I guess, both the points pretty much convey the fact that I was destined to intern at NCL. Now since we’re on the topic, I will also recount yet another incident where I proved to be lucky. Since NCL was a new station, it was added to the preference list just before a couple of days of final submission. So most of the people didn’t bother to disturb their already prepared preference list of 314 companies, but for me the case was quite the opposite. I religiously changed all my 314 options and moved NCL to the top, making it my first preference. I guess, this is the most prominent reason why I was allotted the station of my choice, even after having an average CGPA of 7.5. I’m one of those guys who simply love to intern; as in, NCL was my 5th organization where I was interning. But the experience I gained at NCL was truly epic, rest of my internships don’t even come close to it. It was literally, huge! Actually I’m passionate about the prospect of applying Chemistry to bring in astounding innovations in the field of Electronics and during my internship program at NCL, I was fortunate enough to work on one such innovation. I was allotted a very respected scientist from the Catalysis Division as my mentor. In our first meeting itself, she understood my needs and allotted me a project based on photocatalytic water splitting where I was given an opportunity to appreciate the interdependence of two of the most diverse disciplines: Chemistry and Electronics. I worked really hard on the project, staying up to 12 hours a day (including Saturdays) in the laboratory! I was so enjoying my work that I even promised my mentor to stay for a week extra after my PS-1 program officially gets over, which really impressed her off and she allotted me a second project, even before I could complete my first one. Unfortunately, I’m not allowed to disclose anything about my second project due to security reasons. The work environment was great, all the PhD research scholars were very supportive and were available for any assistance whenever required. I was given the full responsibility of all the instruments, I was working with, which includes tremendously expensive instruments like GC and Photocatalytic reactor. In a nutshell, I can proudly say, in those 2 months, I learnt enough Chemistry than what I learnt in the three years of my college life. Unfortunately, the same can’t be said about Electronics. It would be unfair if I only stick to the technical aspects of my internship. I guess, the location of NCL, that is Pune, made my internship a lot more memorable. Pune is definitely one of the most beautiful cities, I’ve stayed in. However hard I used to work on weekdays, weekends (excluding few Saturdays) were always kept reserved for the awesome destinations which Pune had to offer. In those two months, I visited every possible place in and around Pune, which one can think of. Starting with hill stations like Mahabaleshwar, Lonavala, Khandala and Lavassa to more nearby places like Khadakwasla, Sinhagad, ISCKON etc. To conclude, I will only say, it was the most productive two months, I’ve ever had. Want something similar for yourself? Check out the latest Internships in Pune. Great blog.. very well written..